The synergies between environmental stewardship, sustainable water use and the economy can and must be a high-powered engine of growth. Most business leaders today now recognize the critical importance of water to financial success and long-term growth. Whether as a key component in the industrial process, in energy and food production, or for the threats posed by having too much or too little, the availability of fresh water has emerged as a key element for sustaining viable business. However, climate and the water cycle are changing in tandem. Together, they are posing new challenges, and creating new opportunities, for private sector growth and for corporate environmental leadership. Global warming is leading to fundamental shifts in weather and rainfall patterns, as well as the disappearance of previously reliable water supplies like mountain glaciers, snowpack and groundwater reserves. The global water crisis is real. It poses significant, quantifiable threats to all aspects of business. Clearly, the private sector needs the best information currently available for sound planning and for sustainable operations and management. While ongoing change to global and regional hydrology cannot be undone, we can certainly manage our way to a sustainable water future. Tomorrow's blue (water) economy can still be conducive to growth, while simultaneously accommodating domestic, industrial, energy, agricultural and importantly, environmental water needs. Listed below are 10 things that I believe are essential business knowledge in a world where climate is changing, water scarcity is on the rise, and the need for private sector leadership is becoming ever more apparent. 1. Changing access to available freshwater resources. Climate change is creating haves and have-nots. Hot spots of groundwater depletion, drought and flooding, like those shown below, are emerging around the world. Business needs to know where water will be available, for how long, and how to help sustain that availability regionally. 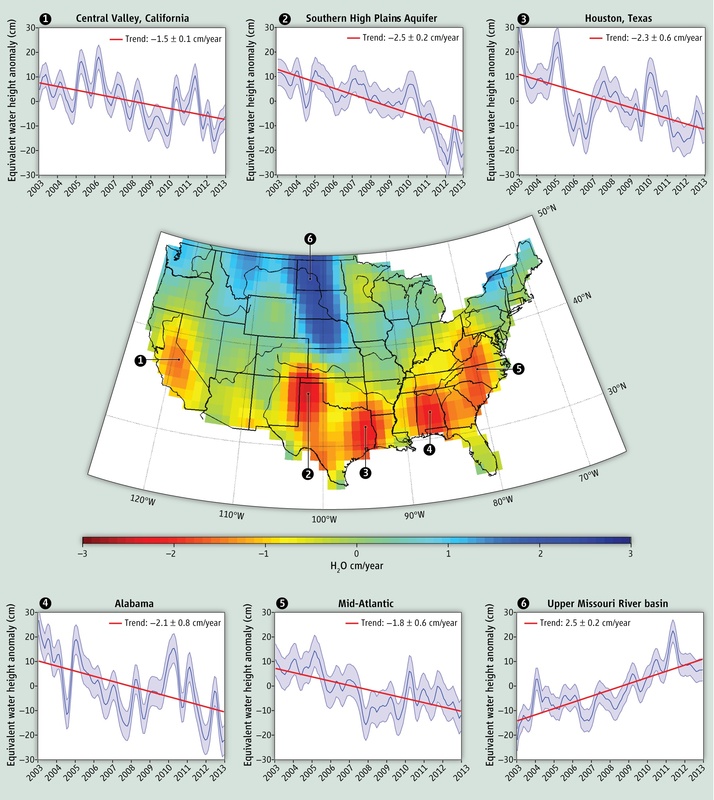 Trends in freshwater storage in the United States as measured by the NASA Gravity Recovery and Climate Experiment (GRACE) satellites between 2003 and 2012. Credit: J. S. Famiglietti and M. Rodell, Water in the Balance, Science Magazine, Figure S1, 2013. 2. Increasing variability in flooding and drought. Records of past climate and projections of the future point to more frequent and powerful regional flooding in some locations, and prolonged drought in others. The Bangkok floods of 2011 crippled the hard drive industry while creating worldwide shortages. Business around the world will be impacted by these changing extremes. 3. Expect more transboundary conflict. Changes in water availability in shared river basins and aquifers will exacerbate existing tensions and create new ones. Think the Middle East and South Asia. While often not directly the cause, roughly 90 percent of violent conflict occurs in regions of severe water stress. 4. The food-water-energy nexus. It takes lots of water to grow food and to produce energy, and lots of energy to heat, treat and transport water. Will there be enough water to produce food for a continuously growing population? Will some regions, like California, need to transition away from an agricultural economy? 5. New business opportunities in the water sector. The demand is growing for new technologies that can yield far greater efficiencies, use less energy, and that minimize greenhouse gas emissions and dangerous wastes. Membrane technologies and environmentally-responsible mining services are prime examples. 6. Water as a commodity. Until water is properly costed, priced and valued, far too much of it will be wasted. Water should be used, reused and reused again, and when returned to the environment, it should be as clean or cleaner than when it was withdrawn. The market for by-products of water use and treatment, including sludge and brine, is in growth mode. 7. Agricultural efficiency. Most of the world's water -- 80 to 90 percent -- is used in agriculture. Tremendous opportunity exists to greatly improve agricultural efficiency. Precision irrigation, the expansion of greenhouse agriculture, the development of drought and saline tolerant crops, and associated horticultural engineering are growth areas. Look to world leaders like Israel, where pioneering efforts stem from a history of perennial water stress. 8. Water markets, water banking and virtual water. Water, water rights, and subsurface storage are already being routinely traded. Expect these markets to grow, along with recognition of the flow of virtual water -- the implicit imports and exports of water associated with those of food, energy and other commodities with a significant water footprint. 10. Public-Private Partnerships. Managing our way through the global water crisis will require focus and active participation from industry. Most government investment pales in comparison to the scope of the problems described here. A grand challenge is on the table for business to step up and truly lead, with environmental conscience and for the mutual benefit of all involved. Beyond corporate environmental responsibility, access to and the judicious use of shared resources, public-private partnerships may well be the key to enabling the technological advances that are essential for the peaceful and prosperous coexistence of environmental stewardship and economic growth. While the resource-rich, environmentally-carefree days of earlier decades are now part of history, with strong business leadership and public-private partnerships, the best is likely yet to come.